Abhishek Mishra ( co driven by V Venu Ramesh Kumar) has won the 2018 Maruti Suzuki Desert Storm. Putting up a brilliant performance during the last three legs of the Rally, Mishra won the coveted title after failing in the last two attempts. Driving his rally prepped Grand Vitara, Abhishek Mishra (Xtreme category) looked unbeatable as he flew over the dunes and at the same time ensured that he brought the car home, safely after each stage. Team Maruti Suzuki Motorsport's Suresh Rana was the only driver who kept the pressure on Mishra, however, an engine problem forced Rana to quit. This allowed Mishra to back off a bit and conserve his car, whilst keeping an eye on Raj Singh Rathore in the Isuzu Dmax VCross who was trailing him. Rathore, never have up, right until the very end, but Mishra managed to keep his cool and maintain the gap. In the end, Mishra had a lead of over 30 mins. Niju Padia and Nirav Mehta of team Desert Raiders finished third. In the Moto Class, Aaron Mare of team Angata Racing took top honours. Astride the KTM 450, Aaron was cool and calm, throughout the Rally. He was trailing Hero MotoCorp's CS Santosh up until Leg 3, where CS suffered a huge, 120kmph crash. On safety grounds, Hero and CS Santosh decide to retire from the Rally. This prompted Aaron up the leader board and from then on, there was no looking back. TVS Racing's Santolino Lorenzo stood second in the standings. Santolino did make a late charge in the Rally, winning the penultimate and last leg of the Desert Storm. However, it wasn't enough to surpass Aaron Mare. Sanjay Kumar from team Angata Racing finished third. In the Xplore category Nipun Agarwal and Kabir Mansharmani were the overall winners while in the Ndure class Ashish Budhia and Arindam Gosh were the winners. 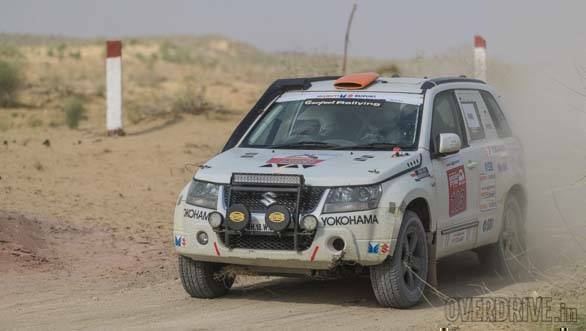 The 2018 Maruti Suzuki Desert Storm was quite a challenging rally that proved to be a lot more difficult than expected. The attrition rate was pretty high as a number of cars and motorcycles broke down, owing to the heat and the terrain. Pune based Ashish Raorane, for instance, was running fourth in the Moto category when, out of no where, his KTM's engine gave up, a couple of kilometers before the end of the final stage of the Rally. But that's what rallying is all about, and the Maruti Suzuki Desert Storm, once again lived up to its reputation of one of the most difficult rallies in the country.